You start your day by soaring through the sky on an umbrella, decide to skip some rocks in an epic competition, balance a ginormous ice cream cone, and round out the afternoon by giving Bill Murray a run for his money as ultimate ghost buster! Sound like a fun afternoon to you? Perhaps you’d rather whack some pesky moles, fight ninjas and shoot down intergalactic aircraft, and then take a leisurely dive under the sea hunting for sunken treasure. If none of that interests you, you may like ultimate pinball, bouncing through space, and attempting to contort your body to fit through holes in the wall. Maybe you’re the type of person who likes directing balloons through a skyward obstacle course or the sort of fellow who wishes to spend their time navigating a star-ship through space. If ANY of these activities sound like a fun way to kill some extra time, you might want to check out, Wii Play Motion from Nintendo. Rated E for everyone, Wii Play Motion is the ultimate in family gaming. You and your family, no matter how old your kids are, will find something to love about this new fun-filled variety game from Nintendo. 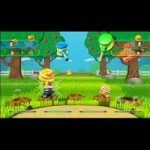 Check out the official release video and see some of the super-fun games included in Wii Play Motion! When you purchase Wii Play Motion, you’re not just getting one game….you’re getting TWELVE. Twelve different games are included….what a bargain, and what a way to find a game that is sure to please everyone in your household. My kids immediately fell in love with this game. This was the very first Wii game they were exposed to….and they were hooked from their first try! The games included on the disc are easy enough for a smaller child to enjoy them, but are also set up in such a way that adults and older children and teens will enjoy them as well. As you can see, my kids LOVE to get in on the action. My son loves Veggie Guardin’ while my daughter’s favorite is Wind Runner. Again, with 12 action-packed games to pick from, everyone in the family is sure to find a game they love. This game comes packaged with a Wii Remote Plus Controller, and at an MSRP of $49.99, this is quite the package! And there are TEN MORE games included! 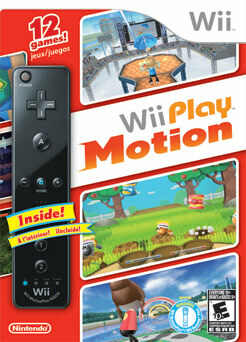 Pick up a copy of Nintendo’s Wii Play Motion today!! Change up the same old boring family game night into something that gets your family moving and having fun! For more info, head to the Official Wii Motion Website for details! Ooh. Sounds fun. My boys and I love playing Wii together. 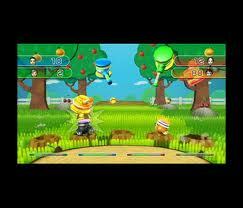 We especially love the games that are fun and family oriented and rated E. I will have to be on the lookout for this. Thanks Bekki! (Wii Play Motion Review)This looks like a whole lot of fun for the family. I know the kid’s would like it.